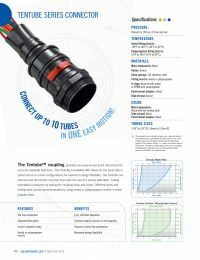 The Tentube™ coupling provides one easy-to-use quick disconnect for up to ten separate fluid lines. The Tentube is available with valves on the body side in panel mount or in-line configurations for maximum design flexibility. The Tentube can connect and disconnect up to ten lines with the use of a simple slide latch.